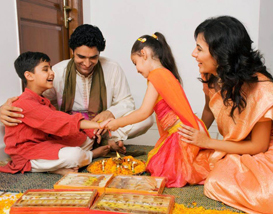 Raksha Bandhan » Rakhi Festival Fun » How to Make a Rakhi? 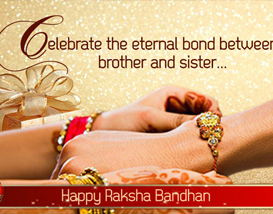 Rakhi is the physical symbol of the emotions involved with the festival. The emotions of love, affection and care. It is the sentiments that matter on this day and what can be a better expression of the sisterly love than a self made rakhi. 1. Rakhi is generally a decorated silk thread. It may be a simple thread or it may be decorated with beads or designer motifs, religious symbols or even studded with jewels. 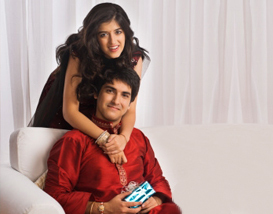 Here are a few tip on how you can create your own rakhi. Take a bunch of silk threads, multicolored if you want a colorful rakhi. Red and yellow are considered auspicious colors. You can also use a strand or two of golden thread. The threads should be around 30" long. Fold the length of the thread bunch to half. Tie a tight knot at one fourth of the length using the cotton thread. Cut the loops of the folded thread and fluff the open ends with a hard brush. Decorate the upper part with sequins, beads or religious motifs. If you are using multicolored threads arranged in some specific way, cut them short to a suitable length not more than ½". 2. These days in vogue are rakhis made of kalava or moli (the read thread used for tying on wrist during a religious event). These are more suitable for those who have to keep the rakhi tied for a longer time, as in some faiths when it is removed after three days or it is removed on the Dussehra which falls in October. Take a 50" long thread and fold it in the middle. Plat the thread in the desired manner. Tie the cotton thread leaving some space at the ends. Remove all the loops from the ends. Stick the religious symbol or rudraksh in the middle and if you want decorate the rest of the length of the rakhi with beads or tiny shells. You can stick them or even stitch them on the braided thread. A toothbrush with hard bristles. Once they are independent of loops, with a toothbrush rub hard on these threads and brush them with strong strokes by holding tight on the knot. With repeated strokes the silk threads turns fluffy and Raksha Bandhan soft. To make the string, divide the three-fourth part of the silk thread in two equal parts and plait them sepaRaksha Bandhanrately. At the end tie a knot and brush the end again. Knot the thread uniquely. Put the beads in the threads. Put a locket in the middle of the beads. Then at last tie both the ends.Your fabulous rakhi for raksha bandhan is ready! When making rakhi make an empty frame in the round shape so that the girl can put her photo in the frame, for whom the rakhi is mentioned. This will give a good expression of good relation of sister and brother. Instead of making the base of the Rakhi in the traditional way (resham),one can use varied fancy silk or net, by doing running stitch on one side of a rectangular piece. By stretching the thread one can get a round base which looks trendy as well as different. To make it look nicer one can add layers of the same in different colours. Take a piece of an old t-shirt and fill it with cotton. Fold it in a round shape. Stick black beads for eyes and a red bindi for lips. This time take a little bigger cloth, fill it with cotton in the round shape for the Teddy’s body. You can put sparkles and make the Teddy’s dress colourful and attractive. Now, glue or sew the face and the body with a thread. For the wrist, tie a ribbon to the teddy. Your Teddy Rakhi is ready!! Take two or three colours of slik thread preferably Gold, Silver & Red. Get Gold or silver coins from gold shop & get gold & silver colour net cloth which can be kept under the coin which gives a grand look. Take the net cloth give it a good shape & make a hole in between the cloth which can attach the cloth & the threads. 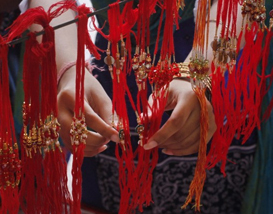 Take a combination of red & gold silk thread. Make a knot as per you convenience but not in the middle coz that should be the joining for the coin, net cloth & thread. Leave the thread open on the two ends. Your Gold Coin Rakhi is ready. Cutout the two narrow sides of matchbox. Now stick the two remaining broader sides with glue. Cover them with grey paper& write WINDOWS on it in capitals. Give it a bright border with coloured tape. Cover with transparent plastic sheet. Take narrow sides of matchbox cover left and cover it with fluorescent colour paper. Draw the keys with a sketch pen. Take the peel of pistachio nut. Draw the keys of mouse with painting colours. Take a red colour ribbon. Paste the keyboard on ribbon & monitor on back of keyboard. Now join the mouse with a thick thread from back of keyboard. Glue the mouse to the ribbon. Take a colored thread and tie about 5 golden beads and a small button after it. Repeat this along the entire length of the thread. Paste any religious picture or symbol on the button in the middle of the thread. Your home made rakhi is ready. Take a thread make a circle of rudraksha or tulasi beads.To the circle of beads attach two laces / a string of beads and hook to tie. The rakhi made like this will be durable and is spiritually good for brothers. Take a marie gold biscuit. Paste two cherries at the place of ears. Two gems chocolate having red color at the place of eyes and nose. Paste a chocolate at the place of tie. Paste a satin thread behind the biscuit. 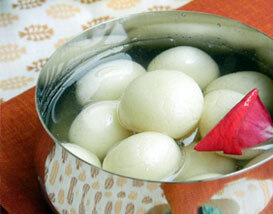 Make plaits of the thread then place a resham ka gola and then decorate it with beads,sitaras and with other items.